This sweet picture book biography made me tear up - the stories of Beatrix spending hours painting makes me think of my own little girl, who spends hours drawing. She has gotten into trouble a number of times for drawing on pads of paper that do not belong to her. She has filled countless spiral notebooks with comic book sketches. She loves books on drawing, but she doesn't like to be taught "how" to draw - she wants to do it her own way. Maybe I have a little Beatrix on my hands? David McPhail's illustrations are beautiful, as always. This is the story of a little girl who loved art. She was always wanting to see art, and saw art in all that she saw around her. She got a paint box from her mother and started painting everything around her. When he family went to the countryside for the summer, she would go out on rowboat with her brother and paint all the nature that was around. She got sick and was in bed for several months. She wouldn't draw, sketch or paint. When she got better she started painting again. When a friend gets sick she paints pictures for him to look at while he is getting better, his mother encourages her to put these pictures into a book. She said, "She liked the little books for little handsThat story she wrote became a bestseller and she went on to write many more books for children. She was the author and illustrator of "The Tale of Peter Rabbit." It's a brief tale of the passion of Beatrix Potter, painting, how it began, was nurtured, and how that first sweet book came to be. I've read several biographies of her, but tried to read with new eyes. It would be hard to choose how much information to include, how much to leave behind. For those young children who've loved her work, and for those who love to paint/draw, they will love hearing some of Potter's story. For the painters, they will also love David McPhail's small works of art, a beautiful one illuminating the text on each page. There are a few Peter Rabbits and paint boxes here and there, too! Although the text is well-written, the warm, inviting illustrations are the star of this picture book biography. The sweet, realistic watercolor and ink drawings honor Potter’s own works in tone and format, such as being bordered by white space. Simple yet engaging sentences convey the story of Beatrix’s childhood, making her story interesting and accessible to child readers who are familiar with her books. Some Potter biographies focus on her adult life as a writer, whereas McPhail’s portrait explores her interest in art as a child, painting nature and pets, which are relatable subjects for young children. Fans of all ages will appreciate this unique look at the famous author. Sweet watercolor illustrations help bring to life this wonderful biography of Beatrix Potter. Perfect to read aloud for younger readers, but older children will be able to appreciate her story as well. This book was really sweet and I liked the illustrations. It was a fun coincidence that the day I read it July 28th) was Beatrix Potter's birthday. Beatrix Potter and Her Paint Box by David McPhail is a nominee for the 2017-18 South Carolina Picture Book Award.Beatrix Potter loved art even in her earliest years. That love only grew when her mother gave her a paint box. From then on, Beatrix painted many of the things she saw around her, especially her pets. Beatrix and her family spent their summers in the countryside, and Beatrix found even more inspiration for her paintings. Throughout her childhood and into her adult years, Beatrix's favorite time was the summers she spend in the countryside with her family, painting the world around her.Beatrix combined her paintings with a story when she learned that a friend's son was ill. She gifted the boy with the story and was encouraged to turn the gift, "The Tale of Peter Rabbit," into a book. That book, along with several others by Beatrix Potter, became one of the most beloved books in the world. And it all started with a little paint box.Beatrix Potter and Her Paint Box is a lovely book that is ideal for both introducing young readers to biographies and as a followup to reading Peter Rabbit. The illustrations are soothing and beautiful, and the text is informative and accessible. This book could be used as part of a Beatrix Potter author study as well as in art classes. This is a lovely example of literary non-fiction for young readers to begin exploring this genre. Young readers will be able to identify with Beatrix Potter in this biography that focuses on young Beatrix's love of art and her passion for constantly documenting what she saw in nature through her paintings. The last two spreads tell the reader of how The Tale of Peter Rabbit came to be and how it became a bestseller. There is no bibliographical information or Author's note further explaining the research on which this story is based, which gives the reader an opportunity to research independently and check sources. Beautiful biography of a famous children’s author and how she got her start. Simple sentences and detailed art make this a perfect book for young readers. This is a biographical picture book. It is a fourth grade level with beautiful illustrations. It is a well-written story. Highly recommended for 4th and up. Lovely watercolor and ink illustrations and simple text pay tribute to the talented creator of Peter Rabbit, Tom Kitten, and Mrs. Tiggy-Winkle, all beloved characters featured in the books of Beatrix Potter. Although the author/illustrator has carefully chosen the details he includes in this biography for young readers, he still manages to provide enough information to intrigue readers as well as some little-known facts that newcomers to her work won't know. I'm actually quite impressed with how much he manages to reveal in such a short amount of space. Youngsters today will surely be interested in learning a little bit about growing up in a wealthy family in 1866 when she was born and how art was a lifelong passion for Beatrix. Because she loved the countryside and animals, that's exactly what she painted. Most interesting of all for young readers, though, is the fact that her first published story was written to entertain the ailing son of a friend. The scenes depicted here are a nice tribute to Potter as are the snippets of rabbits, brushes, and paint boxes. My mother loved Peter Rabbit and all his adventures and collected figurines, music boxes, stuffed animals, and books associated with that mischievous bunny. I'm not sure what prompted the appeal for her, but I know it was a lifelong love for her. She would have enjoyed this brief picture book very much. As for me, I'm impressed that those stories, written so long ago, are still popular with young readers today. This title would be good for sharing with budding artists or authors or as a reminder about where inspirations for stories originate. Teachers will want to add it to a collection related to art and artists. Readers will want to make note of the beautiful endpapers depicting the English countryside. SubjectBeatrix Potter (1866-1943) is the English author and illustrator of such beloved tales as The Tale of Peter Rabbit and The Tale of Benjamin Bunny.Scope This picture book biography begins with Beatrix's childhood, when she receives her mother's paint box. 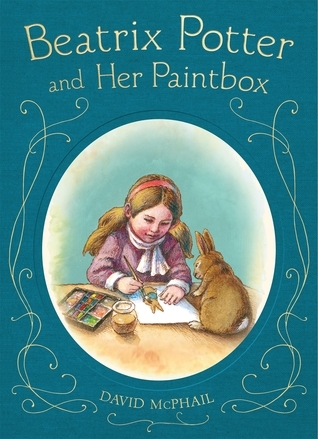 At first it seems as though the author is going to tell a particular anecdote from her childhood involving the paint box, but instead the text is largely just a list of facts: Beatrix fell ill, Beatrix did not like painting lessons, Beatrix wrote The Tale of Peter Rabbit. The book covers almost the entirety of her adulthood in the final two pages, but does not mention her death.About the IllustrationsThe watercolor and ink pictures are done in David McPhail's instantly recognizable style. They have lots of warm light in them, which portrays a coziness many young readers are likely to associate with Potter's stories. Unfortunately, the pictures are only direct translations of what is in the text, with no real additional details or personality. The color palette also makes the pictures feel old-fashioned, and almost boring.Author's NoteThis book does not include an author's note, but there is a dedication in which the author thanks Laura for encouraging him to write a book about his hero.Additional CommentsThis book might work as an introduction to this author for a kindergarten class, but it is unlikely to meet the requirements of most book report assignments, as it does not tell when the subject died, or even really how she became so well known. The text is true to real life, which is appreciated, but it doesn't do enough with those real-life details to warrant publishing this book in the first place. First reviewed on LiterariteaWhat It Is: A picture book biography about Beatrix Potter.What It’s About: This book focuses primarily on Potter’s young life. She had a lonely childhood because her brother was away at school (except for the summers), and she had no other siblings. She spent much of her childhood painting, taking care of small animals, and the like.What Works: Focusing on Potter’s childhood is an easy access point for the target audience of this book. Watercolor illustrations are bright and in keeping with the focus on Potter’s painting.What Doesn’t Work: The book as a whole feels “okay” rather than remarkable. Lack of end matter and lack of depth to Potter’s story make this feel like a sweet story rather than a robust biography of a famous author.What I Think: A suitable picture book biography about a beloved author, but not one to rush out and buy.What I Recommend: This is a solid library checkout. If you’re enjoying Potter’s works with your children (home or classroom), consider checking this out to enjoy alongside. If your children are reading Potter’s stories on their own, then I’d recommend Who Was Beatrix Potter? for a more rounded, fleshed out biography. Delightful picture book. If you like this, you may also like The Cottage Tales of Beatrix Potter by Susan Wittig Albert. They are cozy mysteries for grownups and they, too, are very dear to me. David McPhail has captured the very essence of Beatrix Potter's art and storytelling with his picture book biography of Beatrix Potter and how she came to paint as a little girl. Beautifully illustrated! Exceptional execution of a gentle and endearing story.As for the story, since Beatrix was taught by nannies and such upstairs in her bedroom, and on special occassions was allowed in the sitting room with her parents, they notices how fond Beatrix was of the paintings so Beatrix was given her mother's box of paints by her mother to encourage her creativity. Even on summer vacation with the family in the country, Beatrix painted. She painted everywhere she was and went.After being very ill and bedridden for along period of time when she was young, she knew later in life, when her friend became bedridden how horrible that was and she drew her sick friend, Noel, a painting with a story to it. Noel's mother asked Beatrix to create a full story to share with him and that is how Beatrix came to be a beloved author of many special characters such as Peter Rabbit, Tom Kitten, etc. Published by Henry Holt and Company. A bit oversimplified? This book uses an lot of words to tell a story that by rights could have been told in just a few pages - leaving room for more interesting information about Ms. Potter.Beatrix Potter came from a wealthy family. They spent their summers in the country and winters in Town. She loved to paint, and especially liked painting the animals she kept as pets and saw outside.There - I gave the gist of the book, now it's up to David McPhail to give us some more stories about the woman whose books for children are still widely beloved.I'd recommend this book to a very small child who's maybe just discovered Peter Rabbit and Jemima Puddleduck and Mr. Jeremy Fisher and wants to know about the lady who wrote them but can't read harder books than those. This story is a biography of a beloved author of children’s books. Who doesn’t love Beatrix Potter’s stories (The Tale of Peter Rabbit)? This book was written with illustrations and tidbits that show children who Beatrix Potter was with pictures and easy text. Beatrix loved nature as a child and she expressed that love through painting. The author of this book shows young children how to enjoy art and hopefully become inspired to discover their own inner artist. This book is suitable for very young children although adults who love Beatrix will love this book as much. First sentence: Beatrix Potter was born on July 28, 1866, in London, England. Premise/plot: David McPhail has written a picture book biography about Beatrix Potter, author-illustrator of dozens of picture books including Peter Rabbit. The book focuses on her childhood through the publication of her first few books.My thoughts: I enjoyed this one very much. I really liked the illustrations. And I thought the text was very reader-friendly. It wasn't text-heavy. It was just the right amount of text for the target audience. Overall, a very nice biography. Charming watercolor paintings, similar in style to Potter's herself, illustrate the story of Beatrix Potter as a child, loving the countryside and her pets, and painting everywhere. She wrote the Tale of Peter Rabbit as an illustrated letter to a sick child; his mother told her to get it published. No sources given, so not a biography in my definition, but a cute picture book based on a real person. Sweet book. I think any book about artists I tend to have a soft spot for. Story is a biography of Beatrix Potter; McPhail's watercolor and ink on illustration board are succinct and intimate. For Beatrix, drawing became the one thing she could depend on, her solace and comfort. It was a nice revelation to find out how the creator for Peter the Rabbit came about! I have mixed feeling about this book. I like that the illustrations are reminiscent of Potter's,but I felt the biography stopped too short and should have gone into her life and career. I think how successful she was is the most amazing part considering what she was up against as a woman to do something on her own in that time period. Could inspire developing artists, for grades Pre-school-2. (Biography) I liked this biography because it was in a story format. This would be good for kids who need to learn about someone in history but do not do well with the typical set up of a biography or informational book. A perfect first biography to pair with Potter's famous tales. The details are delicious; the watercolor illustrations are lovely. The author manages to convey a little of the loneliness of Potter's life in a matter-of-fact way that's perfect for the young audience. I don't know how many Beatrix Potter biographies I've read at this point but I love her love of animals and how she wasn't particularly good at keeping pets. I was a bit underwhelmed with this book to be honest. I took off a 1/2 star cos I wished there was some back matter--more to the story. I honestly did not know about Beatrix Potter's personal story and enjoyed learning about her in this short, simple bio. A brief biography about Beatrix Potter. My first graders went to a play featuring some of her books and I would have liked to have had this book to tell them more about her life. With her "new" book being published later this year, this is a good addition to a library. Lovely illustrations! Lovely simple biography, the illustrations are fittingly old fashioned and the text is brief but has impact. David McPhail - David was born in Newburyport, Massachusetts and attended the School of the Museum of Fine Arts, Boston. While there, he began illustrating. He is now an award-winning author and illustrator of nearly 200 books beloved by children, parents and librarians across the United States. McPhail has garnered many prestigious awards, including a New York Times Book Review Best Illustrated Book of the Year for Mole Music in 2001. McPhail’s other books include First Flight, which the New York Times praised as “hilarious and helpful”; and Lost!, which was chosen as an American Bookseller Pick of the Lists.McPhail has four children, three stepchildren, and is a proud grandfather. He is married to Jan Waldron, with whom he has written and illustrated several books. He lives in Rye, New Hampshire.